https://sep.yimg.com/ay/yhst-33477391359232/red-carnation-coral-dendronephthya-species-carnation-soft-coral-christmas-tree-coral-strawberry-coral-tree-coral-7.jpgRed Carnation Coral - Dendronephthya species - Carnation Soft Coral - Christmas Tree Coral - Strawberry Coral - Tree Coral Expert Only!!! Red Carnation Coral - Dendronephthya species The coral animals are a group of polypoid marine animals belonging to the Phylum Cnidaria. These corals resemble small sized sea anemones and live in a skeleton of their own which is secreted by their body. This exoskeleton is calcareous in nature and is called as �coral.� Some corals gain massive hard structure while, the others may constitute big branched colonies. These corals are often colorful and attractive. This makes them an ideal add on for marine aquariums. 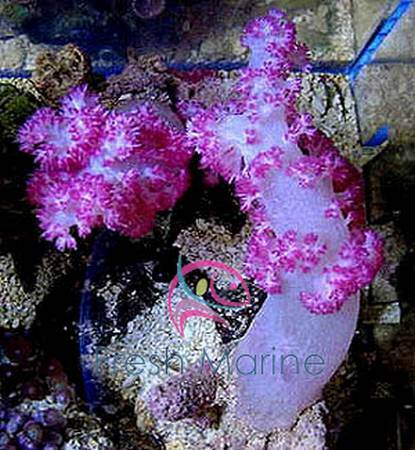 One such coral, Red Carnation Coral of Genus Dendronephthya, is used to grace a marine aquarium. Dendronephthya species are some of the best looking corals in the world. This article deals with the various aspects of Red Carnation Coral that may be handy in case you are considering these corals for your marine aquarium. Other names: Red Carnation Coral is also commonly called as Colored Tree Coral, Colored Cauliflower Coral and Strawberry Coral. The scientific name is Dendronephthya species. Coral Type: As the Red Carnation Coral has spicules embedded in its body tissues, it is categorized as �soft coral.� Spicules are very small crystal like structures made of limestone that provide some degree of rigidity to the coral. Food: Red Carnation Coral is carnivorous in nature. It filter feeds marine miniscule and acellular planktons. It feeds a few numbers of times per week. Origin or natural range: Red Carnation Coral mainly originates from the marine water bodies of a South-East Asian country, Indonesia. Size: Red Carnation Coral is found in diverse sizes depending on various factors such as the depth of water where it exists, the flow of the surrounding water and environment to name some. As an exemplary, if compared to a ball then, a small sized Red Carnation Coral is smaller than a baseball. A medium sized Red Carnation Coral is smaller than a soft ball while, a large sized Red Carnation Coral is larger than a soft ball. Color: Red Carnation Coral has the color variations of red, yellow and orange. Compatibility: Red Carnation Coral is calm and lives peacefully with other animals. Illumination: Basic fluorescent to strong metal halide is enough for the Red Carnation Coral. The Coral requires less light as it has a symbiotic relationship with the algae zooxanthellae. This photosynthetic alga dwells within the Red Carnation Coral. The alga supplies the Coral with the required nutrients to form its calcareous exoskeletons. Water movement of the aquarium: Red Carnation Coral requires moderate water movement in the marine aquarium. Current: A constant supply of indirect current works positively for the Dendronephthya species. Feeding: In your marine aquarium, you will need to feed the Red Carnation Coral many times each day. The food consists of phytoplankton and the other marine planktons. Red Carnation Coral requires high maintenance and therefore refer to an aquarist as and when required. The Coral lives peacefully with the other marine aquarium members. Red Carnation Coral should be introduced in an already set reef aquarium. Add some trace elements in the water for healthy growth of the Dendronephthya species. When putting in a new Red Carnation Coral in your marine aquarium, do ascertain the light intensity where it was previously kept. Keep the new coral in a similarly illuminated environment. Slowly raise the intensity of illumination, if required. Caution: Red Carnation Coral is very sensitive to its surroundings and any fluctuation in the environment of your marine aquarium beyond the specified limits may prove lethal for the coral. A Dendronephthya species, Red Carnation Coral can yield a great look to your marine aquarium, provided you toil hard to maintain it. After all, hard efforts pay off well!